Thomas Schueller - Recipient - The Eye-Bank for Sight Restoration, Inc.
As a 70 year-old semi-retired corporate lawyer and newlywed, Thomas Schueller was eager to begin a new phase of his life. An avid sportsman, he enjoyed skiing and road biking, and intended to engage in an active lifestyle which included travel with his wife Linda. However, his plans for retirement were seriously compromised by a steady deterioration of sight in his left eye. Tom’s blurred vision made tasks like reading very difficult; however, as a sports enthusiast, what caused him the most concern was his loss of peripheral vision and depth perception. Tom gives credit to his wife for being a stalwart when his self-avowed stoicism faltered as he lost more and more of his eyesight. After seeing several doctors, Tom was referred to George Florakis, M.D., corneal surgeon and ophthalmologist, who diagnosed his condition as a bacterial infection possibly linked to a strain of tuberculosis. To complicate matters, a cataract had also developed in Tom’s left eye as a result of prescribed medications. 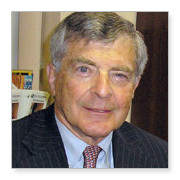 Under ideal circumstances, Tom’s bacterial infection would have been fully treated before Dr. Florakis performed the cornea transplant which he had advised, but the scar tissue had overtaken such a large portion of Tom’s cornea that Dr. Florakis thought it best to perform the surgery without delay. Tom received a successful cornea transplant in March 2009 at Columbia Presbyterian Eye Institute with donor eye tissue from The Eye-Bank for Sight Restoration and his eyesight has steadily improved. Dr. Florakis expects Tom to enjoy excellent vision with eyeglasses once his cataract is removed. Tom realizes that his cornea has come from a person who had said “YES” to donation, and “appreciates this marvelous miracle of being apparently restored to full eyesight.” He is overjoyed that he and his wife, Linda, can once again pursue an active lifestyle and enjoy their children and grandchildren, unencumbered by poor eyesight. Tom is eternally grateful to his donor and thankful for his precious gift of restored sight.